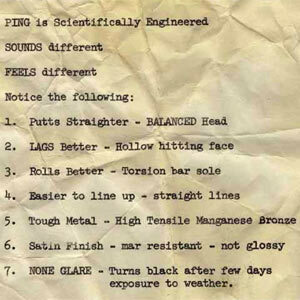 Take yourself back to 1959, the birth of the Ping 1A. The scene: a garage beside a family house in Redwood City, California. It's late at night, but the lights are still burning. A young Norwegian-born engineer called Karsten Solheim has just put the finishing touches to a masterpiece. Not the Mona Lisa or the Lincoln Memorial. No this little gem will turn out to be worth far more than either of those. The Ping 1A putter was the springboard which would launch Solheim to fame and fortune. The Ping corporation has been a family-run powerhouse in golf ever since - their putters alone have won more than 2,000 professional events. Why was the Ping 1A Revolutionary? Solheim's brainwave was to hollow out the centre of the putter and cut two slots in the bottom of the putter head. This effectively redistributed the weight in the putter head away from the centre of the block and towards the heel and toe areas. It gave birth to almost all modern putters which are heel and toe weighted. 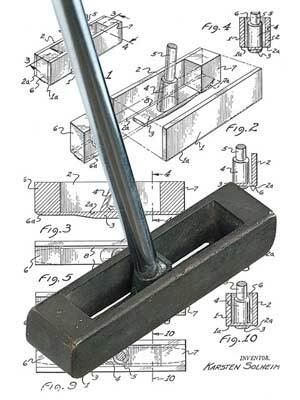 Even though it was by no means as elegant as the putters it competed against in its heyday, the 1A had a technological advantage over them, which was its unique selling point. With more weight distributed towards the heel and toe of the putter, it twisted less if you struck the ball away from the sweetspot. Another way of putting this is that it had a larger sweetspot. What's it like to use a Ping 1A? The first word that springs to mind is "LOUD!" With all that area hollowed out, it's like having a xylophone key for a putter head. The resounding PING sound gave Karsten the name for his company. According to the advertising blurb available at the time, putting with a 1A was a very different experience to putting with other putters on the market. Back in the 1950s almost all putters were bullseye or blade designs. These have very small sweetspots and twist dramatically when you miss-hit them. When this happens your putts miss the hole either left or right, and almost always come up short. Because the 1A had a far greater amount of weight in the heel and toe areas, the sweetspot grew and the effect of missing the sweetspot was greatly reduced. Surprise, surprise... with those credentials, people actually did begin to start putting better. But the 1A was not Karsten's finest masterpiece. Even though he sold a fair few 1As, he was not satisfied when he saw some of them sitting unsold in pro shops when he hoped to sell new stock. After one such proshop visit and a research trip to the Los Angeles Open in early 1966, Karsten set about his greatest work - the design of the Ping Anser. The putter was in production by the Summer and the family was soon overwhelmed by orders for the almost magical putter. Although they're not at all common, you do sometimes find 1As in the "bargain barrel" at a local golf store. They vary greatly in terms of condition, but mint versions are worth a fair bit on the collectors market. Click here for perhaps the most useful document on collectible Pings, and to find out whether your Ping 1A is worth a packet! Can You Still Buy a 1A? Ping 1A putters are still being produced, mainly as a demonstration of the company's heritage rather than as a commercial product, so you can order one from you local Ping stockist. If you want an original 1A, then your best bet is to look in the used racks at your local golf store or on golf auction sites, where 1As sometimes turn up. Here is the current offering on Ebay for a search on "Ping 1A Putter". Feel free to click through if you're interested. Ping Anser - The classic design is hard to beat. Scotty Cameron Newport 2 - Tiger has won all but one of his majors with this putter - that alone makes it a classic.